Metz, France - A team of predominantly the foreign legion of the senior national team, the Black Stars were held to a one all draw in an international friendly soccer match by F.C. Metz, a French first division team at the Metz Community Stadium on Wednesday evening. Eric Addo of PSV Einhoven who last played for the Stars in the 1998 Cup of Nations in Burkina Faso gave Ghana a first half lead, completing a two-man move orchestrated by Skipper Stephen Appiah. But Metz fought back relentlessly to draw level in the 65th minute when defender Denai Aimen soared above his markers to apply his head to register the image-saving equalizer for Metz who slumped to the 18th position over the weekend in the 20-club league after losing 0-2 to Sochaux. The Stars commenced the campaign a compact side, forcing the French team to back track but when Metz got their acts together, they were the first to come close in the 10th minute. Saci Anim flew the ball over the cross bar with only goalkeeper Louis Quainoo to beat and a minute later, the goalie was quick to halt a move with a clearance, after Rasta-haired Dino Djiba had sneaked through an off side trap. 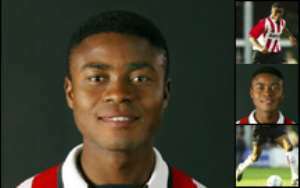 But the stars' fluid attacking force led by newly found Patrick Agyemang of Gillingham, a first division side in the UK, returned the challenged almost immediately through massive supplies from the two nexuses in midfield, Michael Essien and Anthony Obodia. Agyemang who found it tough, settling in the game forced the midfielders to switch their supplies to the wings where Lawrence Aidoo and Eric Addo operated effectively. Eric Addo had a fine opportunity in the 27th minute to put Ghana ahead but goalkeeper Liebus Johan parried his lousy shot away from the rectangle. Four minutes later Addo atoned for his mistake by tapping in a beautiful pass from Aidoo. The move was spectacular as Appiah who had his back to the post, jumped to back heel a mid air volley to Aidoo who threaded a one time pass to Addo to finish. The goal was welcomed with surprised thunderous applause from the local French supporters who cheered Michael Essien of French leaders Lyon throughout the period he played. Things seemed to be going very well for the Ghanaians until coach Mariano Barreto decided to vary his strategy to give every player present the opportunity to feature. That move unfortunately, worked against him as he pulled out almost the entire midfield and frontline to give most of the local player the chance to play. However, before the second group of players could settle down, Aimen had pulled the needed equalizer for Metz. But the substitutes who included two foreign-based players - Derrick Boateng and another newfound striker Lloyd Owusu of Reading, a first division club in the UK - gave a good account of themselves but were unable to score the match winner. Coach Barreto told the GNA later in an interview that in spite of the score line, he was very happy and that similar exercises had been lined up to get the team ready for the 2006 World Cup campaign, which kick starts on June 2, this year with an away encounter against Burkina Faso. The match was to marshal support from the foreign legion to help reverse the downward trend of the Stars who are now ranked 83rd by FIFA behind minnows Guatamala and Trinidad and Tobago. Line up (Ghana, first team): Louis Quainoo, Dan Quaye, Godfred Yeboah, Joe Hendricks, John Mensah, Eric Addo, Anthony Obodai, Michael Essien, Patrick Agyemang, Stephen Appiah and Lawrence Aidoo.